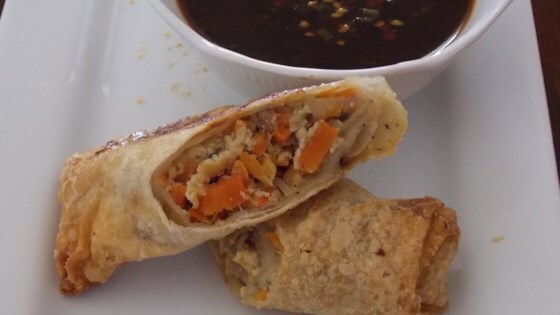 "These crispy eggs rolls are packed with tasty ingredients like water chestnuts, peppers, and chicken. They make a great appetizer, snack, or side dish." Coat a large skillet with nonstick cooking spray and heat over medium heat; cook and stir carrots, bean sprouts, water chestnuts, green pepper, green onions, and garlic until vegetables are crisp, about 3 minutes. Stir in chicken until heated through, 3 to 5 minutes. Combine cornstarch, water, soy sauce, 1 teaspoon oil, brown sugar, and cayenne in a small bowl; stir into chicken mixture. Bring to a boil over high heat and stir, cooking until sauce is thickened, about 2 minutes; remove from heat. Spoon 1/4 cup chicken mixture on the bottom third of one egg roll wrapper. Fold sides toward center and roll tightly; place seam side down on prepared baking sheet. Repeat with remaining filling and wrappers. Spray top of egg rolls with nonstick cooking spray. Bake in preheated oven until lightly browned, 10 to 15 minutes. This was my first time making egg rolls and I like the baking idea. However, I didn't care for the filling. It tasted like carrots and that's about all. Will check other recipes.